IRIS is the largest privately-owned software supplier in the UK and one of the most trusted business-critical software and services providers in the UK today. Its solutions serve over 21,000 Accountancy Practices and more than 80,000 small and mid-size businesses. 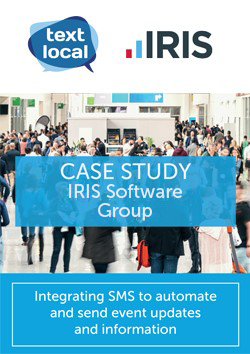 IRIS was able to send bulk SMS updates using the Textlocal online platform via email and the API integration. The team also used a branded Keyword on a Short Code to create two-way conversations, enabling them to respond to customers with concerns in real-time. IRIS also took advantage of Textlocal’s Zapier integration to trigger personalised SMS sends once a customer checked into the event. For IRIS real-time communications were key to the success of their event and SMS enabled them to engage with delegates throughout the conference instantly. Their bulk send messages had a delivery rate of 100%, meaning the impact on customer experience and communications was huge.